We are located on the North side of Houston, within 15 minutes of IAH airport, we have 20,000 sqft of manufacturing space, of which, 12,000 sqft is under two (2) 5 Ton overhead cranes. Lift Truck capabilities of 3000# indoor or outdoor. Also, a full time service field crew for on-site work. 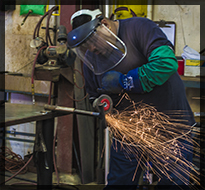 At Sani-Weld, we're committed to helping you eliminate contamination in your production line! Since 1977, our Houston, TX facility has continually led the food processing industry in the development of unique sanitary equipment and processes designed to meet USDA, FDA, 3-A and AMI standards. We've established a long-standing reputation for excellence in the oil and gas industries and we manufacture sanitary products for the medical, pharmaceutical, and semi-conductor industries as well. Our philosophy of fabrication with imagination has inspired new products, pioneered new processes, and earned hundreds of satisfied repeat customers. Let our design engineers streamline your operations to speed productivity and increase profits. We use AutoCad v14 and Solidworks software to assist you with design work as well as fabrication. We can add to your existing facilities or create a start-to-finish production line. Sani-Weld can retrofit your existing production line with bearings, wear strips, sprockets, and rollers.